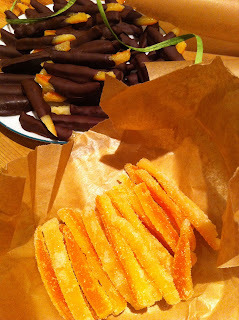 Aga Girls: Candied Orange Peel. I have tried to make this before and failed. However, they are one of my Father's favourite things so I can't really make him a hamper and not include them. Last time I made them I used the recipe out of the Ballymaloe cookbook which was a complete kerfuffle it took days of soaking peel and sticky sugar syrup all over the kitchen. So this time I did a bit of reading around on other blogs to see what other people do. They turned out really well this time and I have now used his recipe repeatedly. Quater the oranges length ways and take out all the fruit. Some people say to take out all of the pith I left it on. Next Blanch the skins by bringing them to the boil in a pan of water.Drain them and repeat three times. This is meant to take out some of the bitterness. Now that the skins were soft I used a teaspoon to scrape out any remaining fruit and some of the pith from any of the particularly thick ones. Cut them up into strips about one cm thick. Put the water and the sugar together over a low heat until the sugar has melted. Once it has melted bring it to the boil and add the peel. Reduce to a simmer. For about ten minutes then leave them in the syrup at least over night but preferably for a couple of days. Then you take them out of the sugar syrup and leave to dry out on a cooling rack. While some of them were still sticky I rolled them in granulated sugar the rest I continued to let dry before dipping in chocolate. The ones coated in chocolate kept fresh much better than the ones in sugar.